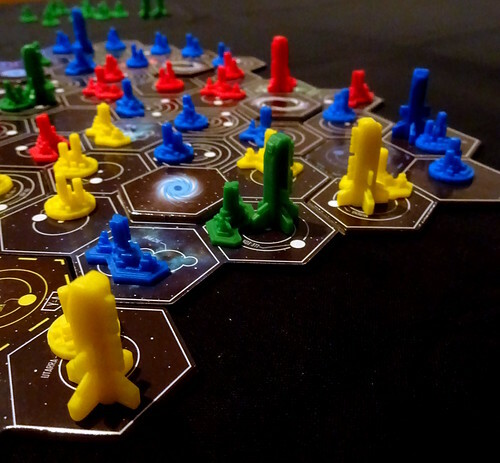 In Small Star Empires, each player takes the role of a different star-faring species, who set out to control as much of the known universe as possible. Explore distant galaxies, exploit planets’ resources and do trade with other races. Still, it is a hostile environment into which the players send out their ships. Due to the menaces of space flight? Sure, but the strategies of the other species are likely the biggest hazard you will need to cope with, as everyone is struggling to get as much of the galaxy under their control as possible. The game board is set up from modular, multi-hex tiles depicting solar systems, mysterious nebula, the occasional empty space, intriguing wormholes and black holes with a very different form of attraction…! 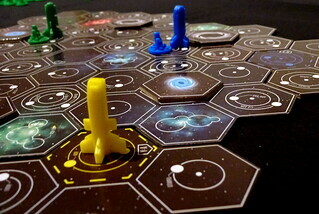 Players’ home systems are positioned around the game board – and off we go. Players take turns making moves: A turn for each player always consists of moving one of their spaceships to a previously uncontrolled system (a solar system or nebula), and (compulsory) taking control of it by positioning a structure of their color (Colony or Trade Station). This is the entirety of the turn. It is then the next player’s turn to make their move. The players’ spaceships (2 to 4, depending on the number of players) depart from their home system, and then continue moving across the board freely. Freely?! Well, in theory…! But more on that coming up shortly! Since players have to take control of a system at the end of their turn, the board fills up quickly, and an average game will be over in less than 30 minutes; with practice we actually ended up closer to the twenty-minute-mark. 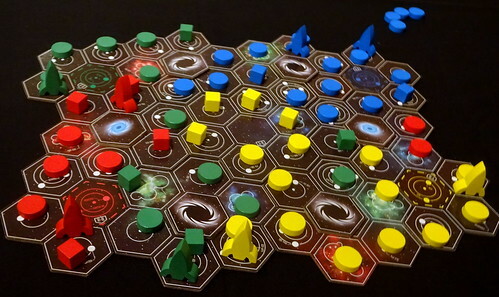 At the end of the game, players score points for their Colonies based on the solar systems they control (one to three points each, depending on the number of planets in the system) and the chromatic nebula. There are three tiles each in three different colors of nebula with which are scored separately, and players score two, five or eight points based on the number of tiles they control in that color. Trade Stations score in the same way, plus they give one bonus points for each adjacent system controlled by the other players, which can give you up to 6 points for that tile making the Trade Stations powerful. Since players get 16 colonies and only four Trade Stations, however, these need to be positioned wisely. To round out the scoring, three extra points are awarded for the player who controls the biggest coherent area – and that’s it! So… turns are move-then-control, and scoring is straightforward…? Sounds straightforward – but where is the fun in the game, the challenge of exploration? Let us circle back to the topic of free movement. In theory, spaceships move without let and hindrance, and can move as far as they want to in a straight line. That applies for your first move, and … that’s pretty much it! Because? Well, because even in space, there are rules. First of all, your ships are out there to explore and extend your control. Returning home is therefore not appreciated. Therefore, they are not welcome to stop in a system you already control. You may pass through, but you can only visit each hex exactly once! Systems controlled by other players are even less friendly, as you are not allowed to enter, pass through or even wave at them with a guide to vogon poetry! As a result, movement options for your ships can very quickly become very much restrained, and you better plan your tactics well in advance, to account for other players and their cheeky movements. Otherwise, your trip into a solar system can quickly become a one way ticket – and with only two ships in a four-payer game, having one stranded on planet Milana IV is not what you want, irrespective of how good the local beer is. On the plus side, the very same movement rules allow you to strategically ward off other players seeking to colonize your back yard – or try to trap naughty opposing ships coming too close for comfort! So while there is no direct confrontation or warfare (certainly a +1 on the present conditions on good, old Terra), the battle for dominance and hegemony is no picnic, and to win you will have to make moves which will not increase your popularity! Optionally, you can add wormholes to your universe. If you choose to play with them, which we recommend, they are positioned on empty hexes of the game board. Wormholes are the nifty escape hatch to a blockade tactic, as they allow you to travel from one wormhole to every other on the board. To do so, however, you need to be next to your entry wormhole, and have an uncontrolled system next to the exit wormhole – so the number of transfers is limited. The game ends when all players have spent all Colonies and Trade Stations or passed since they could not (or did not want to) move any of their ships. Unlike most other games, the pace usually picks up towards the end as the number of movement options dwindles. There are three built-in variants to the base game which we will mention below – however there is an expansion planned as a Kickstarter for 2017 to include further options, including a team game! A definite WANT! The game set includes Unexplored Systems – single hex tiles with a radar screen on the back. These include positive events like finding new solar systems and nebula, deserted Trade Stations you can take over, or a Interstellar Fuel Station which will allow you to make a bonus move. On the other hand, you might run into meteor showers, which damage your ship and reduce its speed significantly. The unexplored systems variant adds a certain unpredictability to an otherwise perfect information game, which may or may not appeal to you based on your preference. We actually felt it was the addition which added the least to the game for our taste, but it is definitely a +1 on flexibility. Variant 2 is a campaign mode, where players go for a pre-defined number of total wins across multiple games. The kicker of this variant is that (aside from the short duration of a single game making it feasible to play a full campaign in one evening) you have to set aside one of your Colonies as a score counter each time you win a game, weakening your position for the remainder of the campaign and thus providing a nice, easy balancing mechanism. Variant 3 is what some might call the ‘unconfrontational’ variant, but for us it worked out superbly. The simple rule twist: You MAY pass through a system controlled by another player (obeying all other movement rules), but for each system you pass, you have to give the owner one of your colonies as toll. Not only does this eat into your supply of structures available to build, but it also scores two points for the other player at the end of the game. This variant significantly weakens the ‘walling in’ strategy, but does not render it unimportant: two points to an opponents and losing a colony are a steep price to pay for anyone. But if you have to allow for the option of another player clearing your line of colonies to roam empty spaces behind it, you’d better consider that in your strategic placement of ships. This variant adds another strategic layer and option, thus lengthening the game a little, but we felt it limited the danger of a player being walled in by one or more players without a valid strategy to counter it. Space-themed games are one of the eternal favorites in gaming – but in spite of its theme, Small Star Empires does not really fit into that trend, and that is by no means a bad thing! Most games in space tackling exploration and expansion tend to be on the heavy side, with supplies, research, development and similar tactics creating an experience of the multiple levels a space explorer needs to all consider to be successful. These 4X games are a very successful genre, but it is important to note that Milan Tasevski’s work seeks its company in other galaxies. Small Star Empires may well be a small game in size, duration and rulebook – but it comes up big in its own domain. The game allows players enough options to implement area control, anticipation of other players’ movement and actions, and draw points from multiple sources which are nevertheless easy to understand and remember. What we loved in particular is that newbies will generally need five to ten turns to learn about the strategic do’s and don’ts – and then re-start the game and be competitive. As with every game (or really anything except the Fiat Multipla, which is just gross), tastes differ. That will also apply to Small Star Empires. That being said, each variants modifies one key aspect of the game, so if you have a peeve with a certain part of the base game, these will likely go a long way into fixing that. 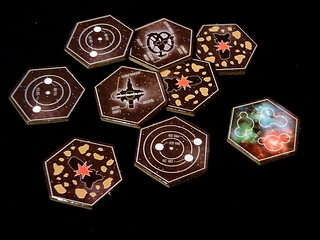 Thanks to its modular set-up you can be very creative in building new game board setups, including galaxies only connected by wormholes – we actually hope that the expansion will have some more tiles to do build a little more extensively. The materials a nice, easily distinguishable and intelligible. The plastic player markers are nice enough – although the wooden tiles and rockets we got as a special at the SPIEL Essen undeniably add a little extra pleasure. Small Star Empires plays quickly, is very straightforward even for new explorers, and still offers plenty of depth which will prompt you bringing it back to the table – either as a nice filler, or for a dedicated campaign evening. In 1620, a ship full of brave meeples set sail to cross the ocean and build a new life in the new world. These meeples who crossed the ocean on the Keyflower built a number of settlements competing for everything, including the buildings their settlements may have. In their first year, these meeples created their new lives.